How and when can you visit the Vatican Museums for free? The last Sunday of every month you can go free to the Vatican Museums. But you can’t make reservations on these days. You have to line up at the entrance to get into the museums for free. And huge numbers of people throng to Rome the last Sunday of the month to go to the Vatican Museums for free. If you are looking for a relaxing weekend of art, visiting the museums on Sunday is definitely not for you. You can reserve entry to the Vatican Museums and the Sistine Chapel every other day of the year, except religious holidays. Reserving means you skip the line at the entrance. All you need to do is show up 15 minutes ahead of the reserved time with a print-out of your ticket voucher. 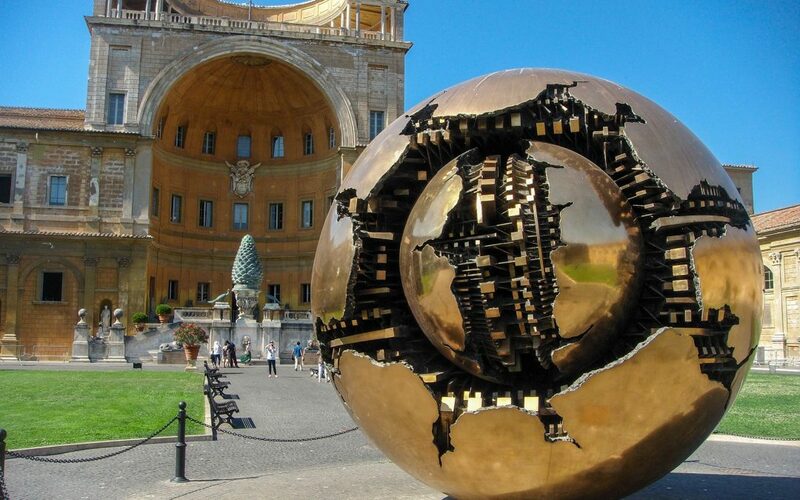 The Vatican Museums are open from Monday to Saturday from 9:00 am to 6:00 pm. A ticket to the Vatican Museums includes entry to the Sistine Chapel as well. The chapel is at the end of the one-way visitor route through the museums. You can reserve tickets easily from home, skipping the lines for the Vatican Museums and Sistine Chapel. Go to web site WWW.TICKETSROME.COM or call 055 2670402. You can get to the Vatican Museums by Viale Vaticano near Piazza Risorgimento. They are termed “museums” in the plural because they are constituted of a huge number of rooms, separated from one another, forming a maze of corridors and rooms. The Vatican Museums stretch over 7 kilometers. They hold one of the world’s largest collections of art. We suggest renting an audio guide; they cost €7 and are well worth it. Some masterpieces can be rather lifeless on their own, but when a guide, even a recorded one, tells you about them, they take on enormous interest. The audio guide to the Vatican Museums come in many languages. We also strongly suggest reserving for this reason. You can collect the audio guide after the metal detectors at the entrance. Then you can start your tour. One of the first things you’ll come upon is the Cortile della Pigna [Pinecone courtyard]. It is named for its gigantic pine cone. Bound to the south by the New Wing, the Chiaramonti Gallery to the east, the Palace of Innocent VIII to the north, and the gallery of the Vatican Apostolic Library to the west. The first rooms on the visitor route are the Gregorian Egyptian Museum, the Pius Clementine Museum, and the Gregorian Etruscan Museum. It continues to the Gallery of the Candelabras, Named for the majestic candelabras that go with the colored marble columns that bound the six exhibition sections. Next is the Tapestry Gallery. This gallery features tapestries from the New School, distinguished from the Old School. The Map Gallery is also well worth seeing. All of Italy’s regions, nearby islands, and their main cities are represented. Before getting to the Sistine Chapel, you come to Raphael’s Rooms. They are named after Raphael, the great painter from Urbino, because the rooms were frescoed by him and artists form his workshop. In their artwork, the Rooms are like a visual anthology of the Italian Renaissance. The visit ends with the Sistine Chapel, unquestionably one of the greatest art treasures of all time. A good suggestion? Take a Vatican Tour with professional guide and enjoy the Vatican Museums with an expert guide!